We can provide large and small tyres that are suitable for your car. Do you need to change your tyres? Check the tread depth of your tyres today and avoid a hefty £10k fine! The video below shows the process demonstrated on a large tyre so you can see how it’s done. You can also download this pdf about Vulcanisation and the law BS AU 159f:1997 that makes sure all work is carried out to the correct standard. 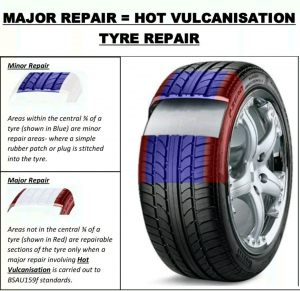 Remember: proper care will extend the lifespan of your tyres. If you take good care of your tyres’ air pressure, tread wear, alignment, and so on, you can increase their longevity. For example, make sure your tyres are not under or over inflated to prevent excessive wear on the outside or inside. If the alignment of your car’s wheels isn’t quite right, this will lead to uneven wear and can significantly reduce the life of your tyres. A good general tip to help your tyres to last longer is to rotte them a frequent basis. Change from front to back, then diagonally (front right with rear left and front left with rear right). In doing this, you will find that wear is more even and the set will last longer as a result. It is best that you check your tyres regularly and have them checked by a professional at least once a year. After 5 years of use, your tyres are beginning to get old. Michelin recommend that after 10 years, you should replace your tyre as a precautionary measure. You should replace your tyre even if it’s a spare tyre or appears to be in usable condition and has not worn down to the tyre tread indicator.